This summer, Pembleton brought Ducky and the Lil’ Guys on an expedition to the arctic ocean to conduct research with his new submarine. One day Ducky and Ted were bored and went scuba diving. During their exploration, they found a sunken pirate ship! The ship was old and falling apart. Ducky had to be extra careful. While exploring, he heard a noise. A baby beluga, which was trapped in the wreckage and missing his mama. 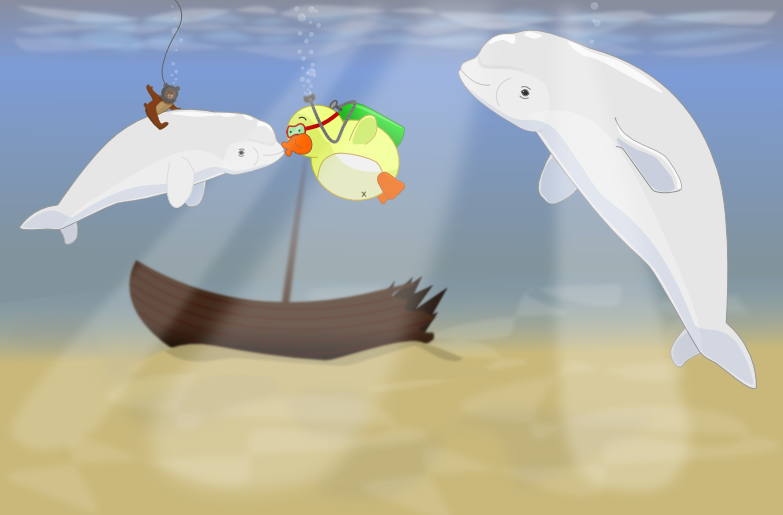 Ducky and Ted helped navigate the beluga out of the ship wreck. But the beluga didn’t know where his mama was, but knew his underwater address. 221 B Poseidon St. Ducky didn’t know where Poseidon St was, but used Pembleton’s underwater GPS. It wasn’t long before baby and mama were reunited. All thanks to Ducky and Ted. When it was time to go, the baby offered Ted a ride and Ducky gave the baby a kiss. It was a great day! Ducky and Ted say goodbye to the Baby Beluga. « Be my friend on Facebook!